Users of both the Android and iOS platforms now have a number of great applications at their disposal that not only make life a little easier doing certain tasks, but also can help save time and money. Today we have news of a free application that lets users search for discounted flights and book an entire trip. CheapOair is a popular application available to both Android and iOS users that have seen it receive great reviews from users that have already downloaded it. The application will let users book flights and hotels together allowing them to plan an entire trip in one go, and doing away with the pain of switching between numerous websites to find the cheapest deals available. Users can search for flights and hotels by arrival/departure time, price, stops, popularity, star ratings, user reviews, and hotel price. The application has 24/7 customer support that can be called directly from the app, and users are encouraged to leave comments via the Feedback section. 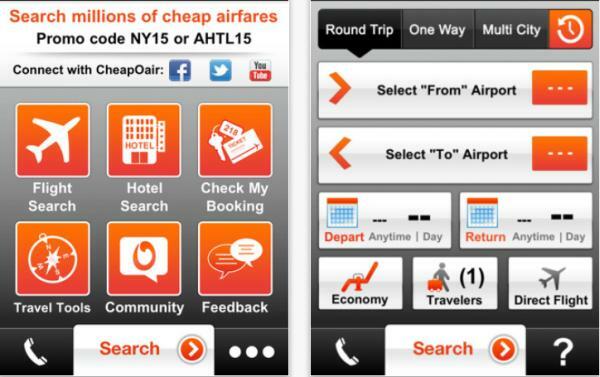 There is even more information provided by the app after you have booked your trip thanks to the CheapOair app guides. The Travel Tools section provides users with a packing list, currency convertor, baggage fee information, and even weather information. While users are on their trip they can use the CheapOair blog, which provides helpful travel insights and allows users to connect via the app to CheapOair on Facebook and Twitter for things such as travel news, contests, and exclusive deals. Users can even save information like meal and seat preferences for future booking, with many commenting on how easy the app is to use. The application is available worldwide and available free via the App Store or Google Play.